One of my favourite gemstone shapes to work with is the 6mm bicone. I love the way the beads fit together and metal seed beads set them off perfectly. In this kit I had a strand of Fluorite bicones, as well as some amethyst rounds, 4mm and 8mm, pearls and metal seed beads size 3mm and 6mm. A selection of coordinating S-Lon cords and some white beading wire completed the kit. Other similar materials and beads can easily be substituted. I posted a picture of the bracelet design on social media and got a great reaction. It also caused a stir with the studio team, so that was the design I decided to demonstrate. Click here to watch the show and fast forward to around 3 hours 24 minutes into the show. This bracelet is made using 6mm bicones and 3mm metal seed beads. Crystal or glass bicones and size 8 glass seed beads could be used instead. Use 8 x 60cm S-Lon (0.5mm/Tex 210). Position the cords on either side of the dots at north, south, east and west and braid for 2cm. The braid structure is Round Braid. On the remaining 4 cords thread on 40 seed beads. Braid in the first 4 seed beads on each cord. Continue to braid adding in the bicones and TWO seed beads after each bicone. Make sure 2 seed beads are added after the last bicones and then revert back to adding in just one seed bead each time a cord is moved. Repeat the pattern until all the beads are used up. Check the length and if a longer bracelet is required thread 4 bicones and 4 seed beads onto the 4 cords at north and south. Thread 12 seed beads onto the remaining cords. Finish the bracelet with end caps and clasp. This necklace is made with 3mm and 6mm metal seed beads. Size 8 seed beads and 6mm round glass or gemstone beads could be used instead. Use 8 x 1m S-Lon (0.9mm/Tex 400). The braid structure is Half Round Braid. Braid for 4-5cm. Onto the cord in slot 9 (below the east dot) thread an alternating pattern of 30-34 large and 30-34 small beads, starting with a small bead. Onto the cord in slot 24 (below the west dot) thread an alternating pattern of 30-34 large and 30-34 small beads, starting with a large bead. The beads are only dropped in when the cords with beads are moved from 9 to 1 and from 24 to 32. This will happen in every alternate full sequence of moves. Braid in all the beads and then braid for a further 4-5cm without beads. Finish off the braid with ribbon ends, or end caps and a clasp. 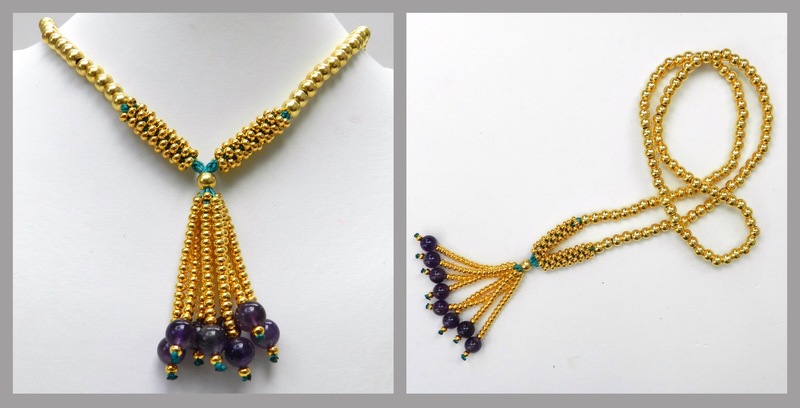 This necklace is made with 3mm and 6mm metal seed beads and 8mm amethyst rounds. Substitution is only possible with 6mm beads with a sufficiently large hole to accommodate 16 cords. The necklace is designed to be long enough to slip over the head without the need for a clasp. Use 8 x 1.2m S-Lon (0.5mm/Tex 210). Knot all the cords loosely at one end. Thread on enough large beads to fit around the head. Centre the beads and move the knot to keep the beads in position at one end. Knot the other end close to the beads and position the cords on the disk on either side of the dots. Thread 6 small seed beads onto all 8 cords. Braid in the beads. Braid for 8 individual moves and add a drop of glue to the point where the braid forms. Allow the glue to dry. Repeat the beaded section for the other end of the necklace and add a drop of glue. Allow the glue to dry. The 7 cord braid is perfect for braiding a selection of beads of differing shapes and sizes. Use 6 x 1m S-Lon (0.5mm/Tex 210) and 1 x 1m white beading wire for the pearls. Thread 4 small seed beads – 20-25 gemstones or pearls – 4 seed beads onto all 7 cords. Braid in the beads and braid for a further 1-2cm without beads. Use chain to create the back of the necklace.